Mother's Day. First celebrated in 1908.Thank you mom for teaching us, for your sacrifices, and for the hope and faith you instilled in us. YAY ! Spring has arrived. The almanac says summer's heat will be as bad as winter's bite. Take the opportunity to get your A/C quote and be ready to spring into summer. Give us a call or simply reply to our newsletter to schedule your a/c install quote or clean and service. Ask about our coupon for A/C whole house install this month. The first air conditioner, designed by Willis Carrier in 1902 was designed to control the humidity in a New York publishing house. It is cool to be green. Manufacturing companies are making the switch from the old company standard refrigerant, R-22 to R-410A. Removing chlorine from air conditioning refrigerants makes them ozone friendly. Energy Star qualified central air conditioners provide a greater SEER rating, which offers up to 15% more efficiency than other conventional models. Check out York's video on maximizing efficiency performance and SEER ratings. We can help provide you with a quality, dependable, and comfortable a/c system to satify your budget. Call us for details on a discount toward your HVAC install. Central air conditioners come in packaged units. One complete unit located outside or a split system unit where the condenser coil is located outside and the evaporator coil located inside. Standard efficiency ratings allow you to compare the performance of different systems. Furnaces use AFUE (Annual Fuel Utilization Efficiency). A central air conditioning systems efficiency measurement is referred to as SEER (Seasonal Energy Efficiency Ratio). SEER considers the average energy used at various temperatures and humidity levels to determine a systems rating. Heat pump units use SEER for cooling and HSPF (Heating Seasonal Performance Factor) for heating. Paradigm's experience and licensed team can help you determine the unit that efficiently utilizes your energy consumption. When retrofitting your home with air conditioning consider the air conditioner system and your current heating system for maximizing efficiency. ENERGY STAR is providing a program for mail-in rebates for the purchase and installation of high efficiency ENERGY STAR residential heating, cooling and water heating equipment. To find out more about this rebate, click HERE! Come join us to extend hope and help to those with special needs. Be a part of life-changing solutions. 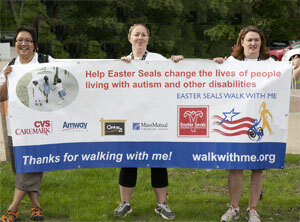 Easter Seals and Zumba Fitness for you! A big congratulations to Tom Farrell for winning a gift certificate from our social media contest last month! Make sure to be social with us and be a part of our social media contests for a chance to win! Everyone's opinion counts. Tell others about great services you received.Let the businesses know they stand out. Vote for any business in NH now through May 18th. Winners announced June 29th. The office extends a LARGE thank you for the in-house chair messages from La Belle Vie in honor of Administrative Professional Day. Call Sara today to obtain your mother's gift certificate for her special day. Thank you for your review, allowing us the opportunity to receive this award! Save Thousands in Water Damage by Installing your Water Leak Detection Equipment for only $499.00 Today! Give Paradigm a call today to get your install! The Team at Paradigm would like to wish everyone during this holiday season a wonderful and warm Thanksgiving. With Christmas coming up around the corner, we would like to remind everyone that we also have stocking stuffers available to keep your family warm this season. Let Paradigm Plumbing keep you warm this holiday season! A big congratulations to the gift card recipient of our trivia contest, Louri Boilard. You can be our next WINNER! Watch for our trivia question on Facebook or Twitter then find your winning answer in our monthly newsletter. Congratulations to October Customer Appreciation Drawing Winner! Thank you so much for being such a wonderful and dedicated customer! Boilers are an old and trusted type of home heating system whose purpose is to generate steam or provide hot water. Most boilers life span is between 15-20 years for oil and gas. Preventative maintenance is the number one key to getting the most life out of your boiler. Upgrade or Maintain my current Boiler System? The replacement choice of a heating system whether it is a boiler or a furnace can be intimidating with concerns over cost and sizing the appropriate system for your home. Costly and frequent repairs are signs to replace a system but even a system that has not required much attention should be reviewed as it ages. In the 1990's most systems efficiency ratings were 80% or less. Cutting fuel costs, creating more space, adding value to my home, increasing my comfort, age of my domestic hot water system, healthier air, energy efficiency, and possibly tax rebate/credit incentives all help to offset the cost for a superior system. Advancements in efficiency, size, construction, maintenance requirements, and fuel consumption now provide you with expanded and improved selections. Contact us for information on NH rebates for up to 30% on installs of Pellet Boilers. Let us help you weigh the cost of your systems repairs, its effectiveness, and life span against upgrading to a new system. Call our team today and let us not only warm your home but your heart too. Natural gas is the most common fuel. Almost all new buildings and homes in New England are choosing natural gas (where available) or propane. The electric boilers may offer clean, efficient and safe heating eliminating problems with pilot lights, gas venting and carbon monoxide but electricity often costs more. Pellet Boilers are becoming increasing popular as an alternative to oil sourced boilers offering self cleaning systems, local use of resources, reduced emissions, full automation and affordability. Perhaps you want to consider changing the current fuel source you use now. We can help you complete the job from start to finish. Call us to get started. November 23rd is the American Foundation for Suicide Prevention's Intenational Survivors of Suicide Day. Find out the warning signs of suicide and how to help a loved one or get help for yourself. AFSP.org. Are You Entitled To a Rebate? Paradigm Plumbing, Heating & A/C. June is here which means Summer is right around the corner! Take alook at our mini-splits topics below. Then give us a call or simple reply to our newsletter to schedule your cleaning repairs or A/C install quote. "Some customers claim to save between 25-40% fuel savings over the course of a year. Find our more at www.paradigmph.com"
Mini-splits offer a great solution to location, installation and expense concerns when considering air conditioning your home. The added bonus of a mini-split is that some models also have a heat pump. This offers you a secondary heat source or can replace an old heating system with this as your primary heat. Residential, commercial, new or existing structures are all candidates. Let us explain how a mini-split system can keep you and your family comfortable. Find out more here! Where Will a Mini-Split Work For You? Installation requires no duct work and these systems have the flexibility to fit virtually anywhere. Since it is a ductless system, this means mini-splits are efficient and environmentally friendly. You can utilize mini-splits just about anywhere! Historic homes, radiant (hydronic) heat, Residential additions, Vacation home/cabin, Schools (individual classroom control), Churches, Hospitals, Restaurants, Remote offices/warehouses, Arena sky boxes, ATMs/office lobbies, Computer/Server room. A big congratulations to Gary Rule for winning a gift certificate from our social media contest last month! Make sure to be social with us and be a part of our social media contests for a chance to win! ENERGY STAR is providing a program for mail-in rebates for the purchase and installation of high efficiency ENERGY STAR residential heating, cooling and water heating equipment when replacing existing equipment or for new construction. Print Out Your Coupon Today! Looking to save some money this year? Paradigm Plumbing, Heating & A/C has you covered! Print out this coupon and you can save big bucks! Offer Expires 06/30/2013. One Coupon per household. Please mention this offer before service or installation. Must have coupon printed at time of service. Our Valentine's Day gift to you is filled with tax credits, rebates and incentives encased in renowned service! When you add $avings with heating sources, you end up with Paradigm Plumbing, Heating and Air Conditioning. We are a service provider whose purpose is to solve your heating needs. Take a look at our heating and equipment sources below for more information. Then feel free to give us a call, email, Skype or FaceTime us to schedule a clean and service, those lingering repairs or that quote you have been meaning to get. Visit Our Website For Your Coupon! Now Featuring: Pellergy! Check out the video below! The brand and/or model number on your unit. The serial number on your unit. The age of your heating system. When it was last serviced and/or cleaned. Any unusual odors or noises. Any leakage around the unit. When you're choosing a home heating comfort system, it's important to be familiar with some important points. Note the existing equipment currently installed and the fuel sources available to you. Square footage to be heated. Measures the average, seasonal thermal efficiency of your furnace and/or water heater. It is the amount of heat actually sent to your house compared to the amount of fuel that is supplied to the furnace. HSPF - Heating Seasonal Performance Factor: Measures heating efficiency of heat pumps. It is the estimated seasonal heating output in BTUs (British Thermal Units) divided by the amount of energy that is consumed in watt-hours. Paradigm Plumbing & Heating has been named by Hooksett Kiwanis as Hooksett's Small Business of the Year. For the past 28 years, Paradigm has been providing residential and commercial remodeling, repairs & maintenance, new construction, and water conditioning services. We service Maine, Massachusetts and New Hampshire. As our Valentine's Day gift to you, here are links to help you save this year! Are you the owner of a Tankless Water Heater? Find out how you can receive a $300 tax credit! Looking to save some money this year? Paradigm Plumbing, Heating & A/C has you covered! Visit our website and print out the coupon that is located on our website and you can save big bucks! One Coupon per household. These two offers cannot be combined with each other or with other offers. Please mention this offer before service or installation. Expires 2/28/13. Must print out coupon from our website HERE.